In February 2014, Sumitomo acquired 100 per cent ownership of Emerald Grain providing the capital strength and balance sheet to fund future growth. Sumitomo is one of Japan’s most respected companies with a history dating back to the 17th century. The company is listed on several stock exchanges in Japan. 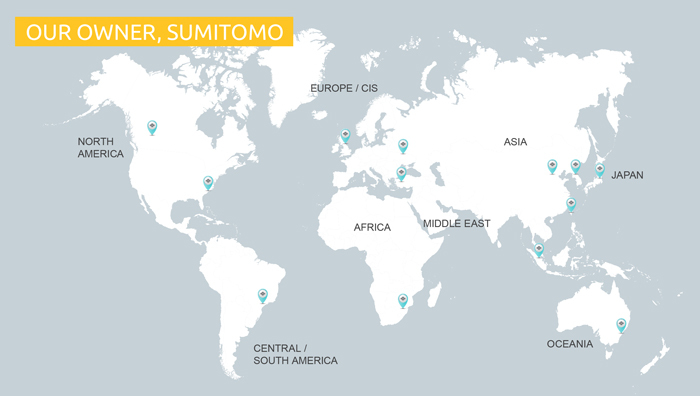 Sumitomo employs 67,000 people at 132 offices in 66 countries. This provides Emerald and our customers unrivaled access to a range of grain consumers throughout the world, particularly into rapidly growing marketing in East and South Asia. Sumitomo’s business in Australasia commenced in 1961 and its current activities include a diverse portfolio of investments, manufacturing, and the import and export of commodities that serve the agricultural, mining and industrial markets. Sumitomo Australia also provides a range of administrative and business services to many of the Sumitomo group companies in Australia and New Zealand. For more information visit the Sumitomo Website or view the Sumitomo corporate video.